Learn to design and code games using Scratch, inspired by the Star Wars™ universe! Star Wars Coding Projects is a step-by-step visual guide to designing and coding in Scratch. The setting is as big as your imagination. 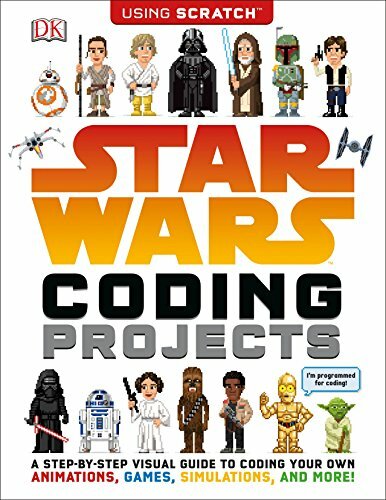 Your favorite Star Wars characters will guide you through fun projects, animations, and games as you learn how to create and code. Draw your own Star Wars inspired sprites to use in the projects. You're the director as you navigate the spaceship you've designed through the asteroid belt you imagined as you go on the jetpack adventures you brought to life. Learn essential coding skills, share the sprites you drew with friends, and even challenge your pals to beat your high scores in the games you designed. Each project lists the sprites you'll have fun creating through simple, numbered steps that are fully illustrated and easy to follow. Coding games have never been so fun, with Star Wars characters to guide you. © & TM 2017 LUCASFILM LTD. If you have any questions about this product by DK Children, contact us by completing and submitting the form below. If you are looking for a specif part number, please include it with your message.